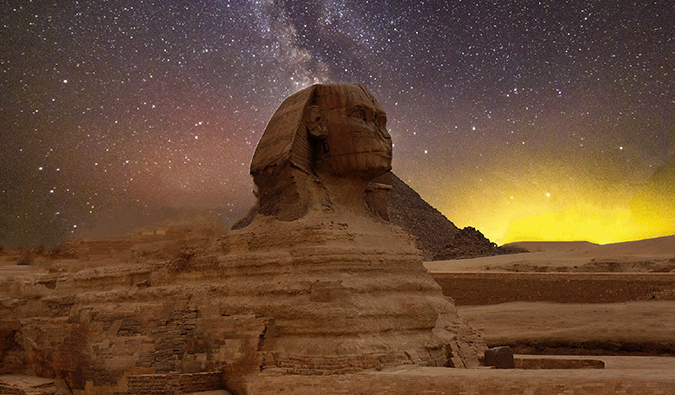 The world is filled with mind-blowing man-made historical sites and wonders out there. Over the thousands of years of human history, we’ve produced some pretty amazing stuff, even if, sadly, not all of it has lastest until today. With many breathtaking and incredible historical sites built by ancient civilizations, it’s sometimes hard to narrow down the best. Think of all the lists of historical wonders out there and how different they. What criteria do you judge on? What makes a good historical site? What makes the best? Everyone has their own criteria in deciding what historical places are good or aren’t good – including me. 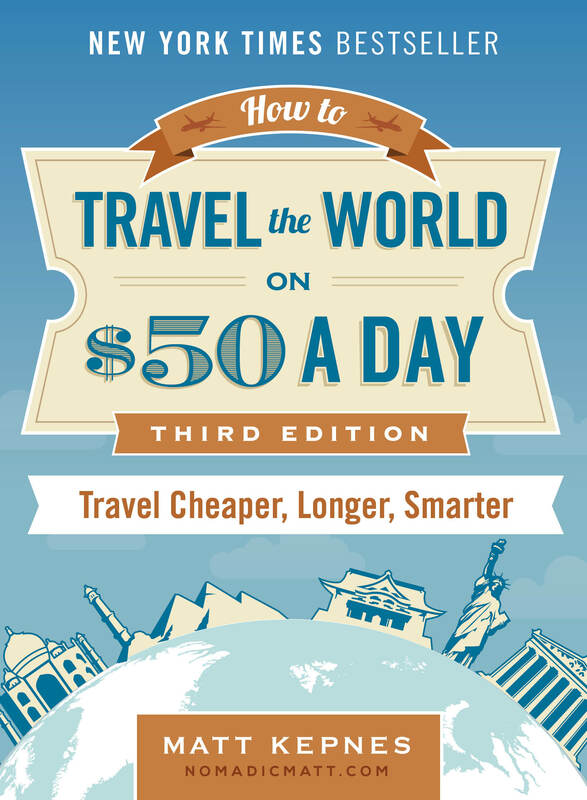 I’ve spent the last decade traveling around the world and have visited more than ninety countries. I’ve seen a lot of the best historical sites and monuments in the world. Below are my favorite historical sites that I think every traveler should try to visit at some point. The story these ruins tell is part of humanity’s story. They guess a deep understanding of our history, power, commonalities, and shared experiences. They show us how we’ve developed as a species. Don’t miss them! Located in southern Peru, this ruined city lies on top of a mountain that’s only accessible by train or a four-day trek. Rediscovered by Hiram Bingham in 1911, it was an important cultural center for the Inca civilization but was abandoned when the Spanish invaded the region. (It is famously referred to as the “Lost City of the Incas,” though that is actually Vilcabamba). The location was made a UNESCO World Heritage site in 1983, and it was named one of the New Seven Wonders of the World in 2007. Concerns over growing numbers of tourists have led to limitations on how many people can enter the site, though only by a fraction of what is necessary. Hopefully, they will limit it even more so this site can last for hundreds of years more. 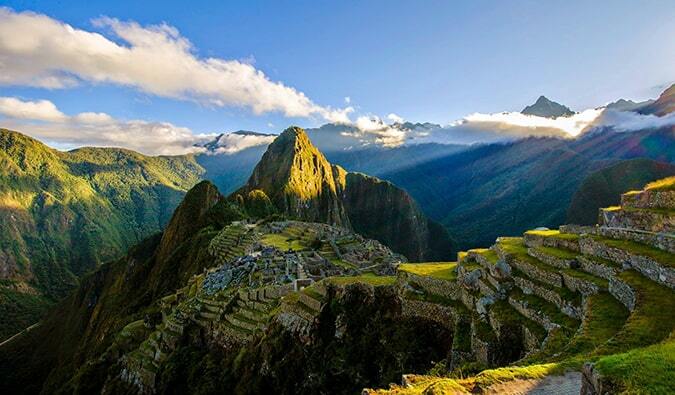 Machu Picchu is open year-round. The easiest way to get to from Cusco to Machu Picchu is to take the train to Aguas Calientes (the town located a few miles from the site). It’s a scenic 3.5-hour trip each way along tracks that run right along the Urubamba River in the Sacred Valley, with dramatic canyon walls on either side. The other way to get from Cusco to Machu Picchu is to walk as part of a multi-day Inca trail tour, which is the far more scenic and rewarding way. My preferred tour company for that is Intrepid. Tour companies have mini-buses that will pick you up from your hotel in Flores and cost 100 GTQ return or 70 GTQ without the guided tour. Regular public buses leave from the Santa Elena bus station every 30-60 minutes and take two hours. They do not run on Sundays. If you’re coming from Belize, you may find a bus at the border for 100 GTQ per person. 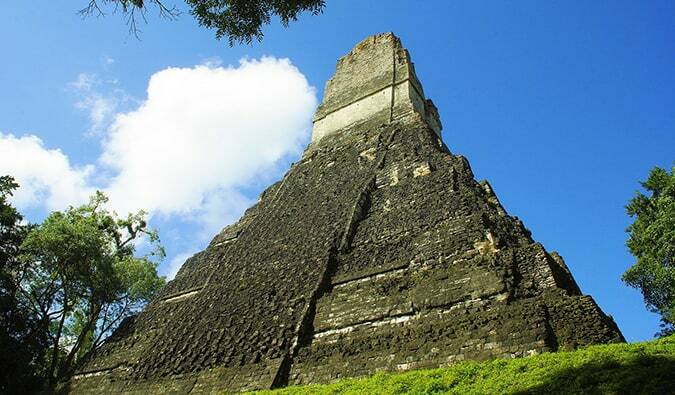 Otherwise, the best way to get there from Belize is to do a tour from San Ignacio or drive yourself (watch out for border officials overcharging you for visas!). The park’s main gate opens at 6 am and officially closes at 6 pm. Adult tickets for foreigners are 150 GTQ. Take a bus from Midan Tahrir. The large buses that go to the pyramids are #800 and #900. The small bus that makes the trip is number 82. When you arrive, you can take a ride on a camel or horse to the pyramids themselves. They are open Monday to Sunday from 7am to 5pm. General Admission is 60 EGP. To go inside the pyramids, it’s an extra 100 EGP. This ancient city in Cambodia was the center of the Khmer Empire that once ruled most of Southeast Asia. This empire fell into decline, but not before building amazing temples and buildings that were later reclaimed by the jungle for hundreds of years. The most popular temples are Angkor Wat, Bayon, Ta Phrom, and Angkor Thom, and they always have crowds. 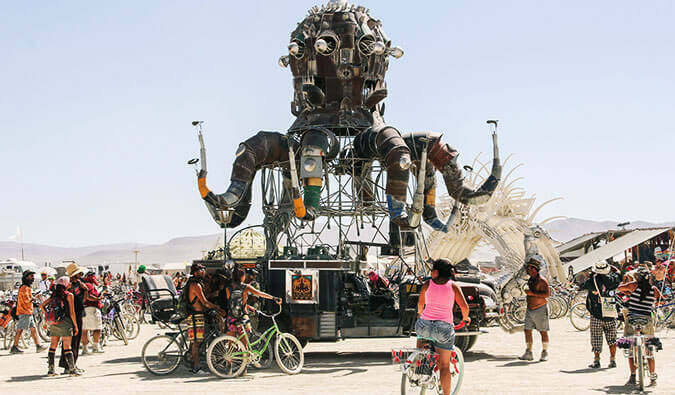 In order to really experience the temples, you’ll need to purchase the three- or five-day pass. The best time to visit is early in the morning before the big tour groups arrive and stay late after they have gone. The temples are about a 20 minute drive from Siem Reap. A 1-day pass is $37 USD, 3-day is $62 USD, and 7-day is $72 USD. There’s no real need to carry the local currency, Cambodian Riels (KHR), unless you paying for really small things on the street. You can rent a tuk-tuk driver for about $20 for a day to take you around or bike around yourself. The area is too big to walk. 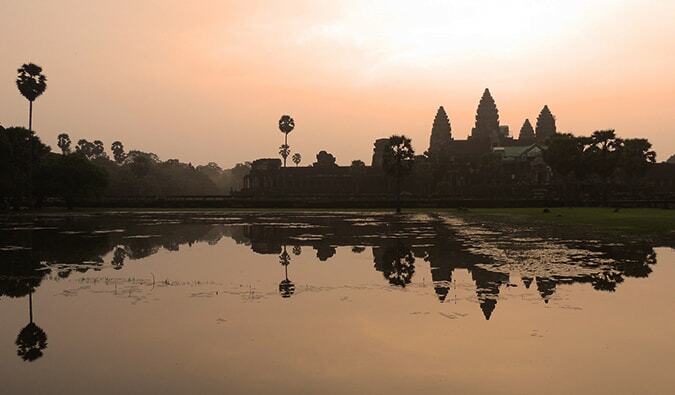 For more travel tips on Angkor Wat, check out this detailed planning guide. Carved into a canyon in Arabah, Jordan, Petra was made famous by the third Indiana Jones film when he went to find the Holy Grail. The site was “discovered” in 1812 by a Swiss explorer who followed some local tribesmen there; prior to that, it had been forgotten to the Western world. Though its founding is unknown, it appears this place had settlers as early as the 6th century BC. Under Roman rule, the site declined rapidly and was abandoned by the late 4th century. 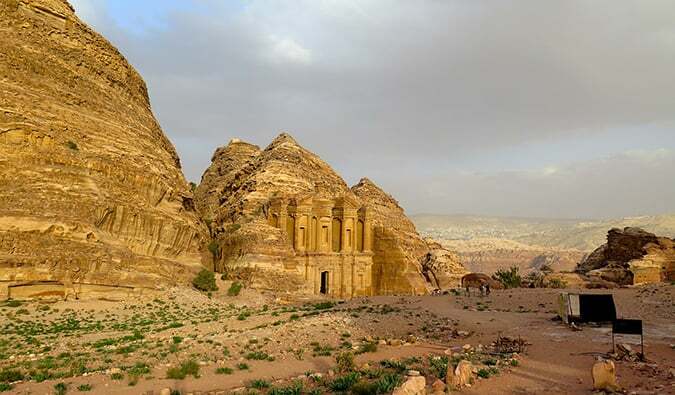 In 1985, Petra became a UNESCO World Heritage Site and was recently named one of the New Seven Wonders of the World. Tour companies run full day tours that include entrance fees, horse ride, and an English speaking guide. Intrepid also offers multi-day tours. If you are driving, Petra is a 3-hour drive from Amman. The site is open from 6 am to 6 pm. The entrance fee is 50 JD. 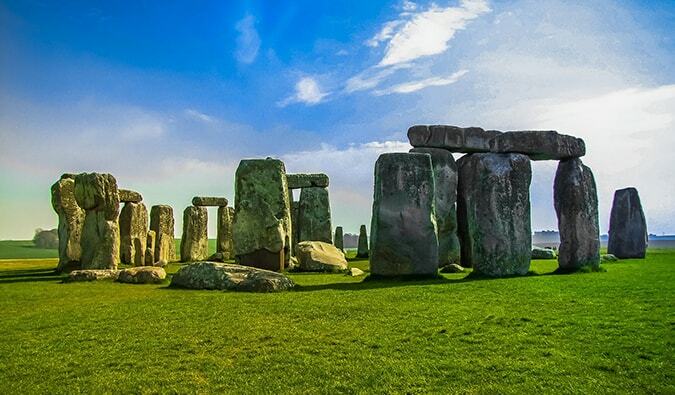 Located near Salisbury, this megalithic structure is over 3,000 years old, and its stones come all the way from Wales. Scholars still are not sure how the builders got the stones there and have tried to replicate the feat, with dismal results. Moreover, we only have a vague idea of its purpose (we’re basically just guessing). Stonehenge is now fenced off, and you can no longer go into the circle; visitors can only walk around the attraction. But it’s worth visiting for the mystery behind it and an excellent and detailed audio tour. Trains leave from London to Salisbury every thirty minutes from 6.30am. Stonehenge is open from 9:30 am to 7 pm from March 30 – May 31, 9am-8pm from June 1 – August 31, 9:30am-7pm from September 1 – October 15, and 9:30am-5pm from October 16 – March 29. Prices start at 17.50 GBP for adults, and 10.50 GBP for children. For more travel tips on England, check out this detailed planning guide. The Colosseum and the Forum are right next to each other in Rome, so I included them together. Remnants of a civilization that once controlled the known world, these sites are breathtaking not only for their beauty but also for their history and age. You’re standing in the spot Caesar walked and gazing into the arena where gladiators battled to the death. The Colosseum has slowly crumbled throughout the ages, and much of it is restricted now, especially the floor and basement where everything was organized. The Forum is great to walk around (and it’s free), though a ticket is required for Palatine Hill. I would definitely get a guided tour because the information presented by the authorities doesn’t go into much detail. Take “B” line Metro station Colosseo. Bus lines 51, 75, 85, 87 and 118 go to the Colosseum as well. You can also take tram line number 3. The Colosseum opens at 8:30 am year-round and closes depending on the season. Admission is 12 EUR. There is free entry on the first Sunday of the month so expect long lines. For more travel tips on Rome, check out this detailed planning guide. Though it’s currently (and seemingly has been forever) getting a face-lift, the Parthenon is still astounding and breathtaking. This ancient temple to Athena stands as a symbol of the power of Athens and a testament to Greek civilization. Moreover, it provides a sweeping view of Athens and nearby ruins, whose temples and buildings are equally as wondrous. Over the centuries, much of it and the surrounding structures have been destroyed by war and thieves. Luckily, the structure still stands… at least for now. Note that there is scaffolding along the right side of the structure; considering it has been there for over five years, I doubt it is going anywhere anytime soon. They do things slowly in Greece. The easiest way is to follow Dioysiou Aeropagitou, the large pedestrian street that starts near Hadrian’s Arch and goes around the north of the Acropolis. You can also take the metro line 2 to “Akropolis” and when you get out of the station walk to your right and follow the people. Many bus routes service the area. You can also take trolleys 1, 5, or 15. Admission is 13 EUR for adults, and children enter free. 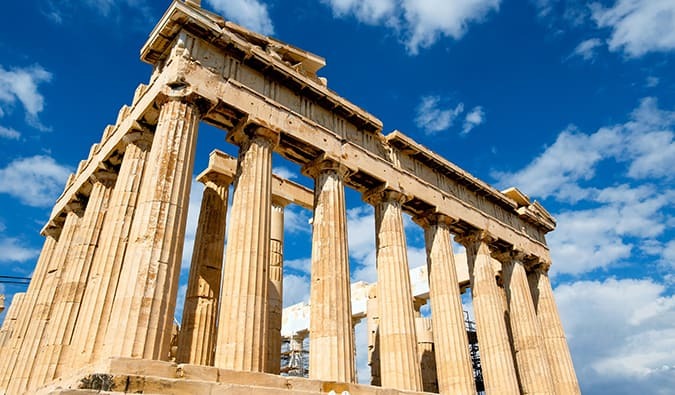 For more travel tips on Athens, check out this detailed planning guide. 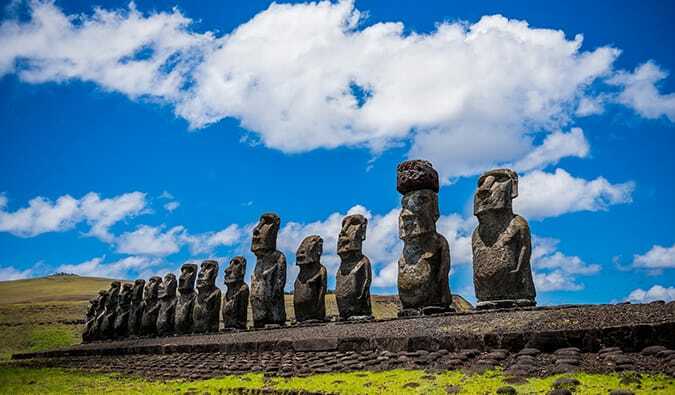 Located out in the Pacific Ocean, Easter Island, a special territory of Chile, is home to Moai statues that are the only thing left of a culture that once lived here. These gigantic and impressively carved heads are just another reminder that primitive people were not really all that primitive. The stones that attract visitors to this island are made out of volcanic ash; many still remain in the quarry, left behind by the inhabitants as diminishing resources on the island left their tribes doomed to wars that finally killed them off. The island is accessible by regular commercial air service from Santiago. Easter Island is relatively small so it is possible to get around fairly easily. For more travel tips on Chile, check out this detailed planning guide. Built in the 1600s, this building in Agra, India, is a testament to undying love. This white marble tomb built for Emperor Shah Jahan’s deceased wife is a must-see for everyone. In 1983, it was named a UNESCO World Heritage site, and also has been named one of the New Seven Wonders of the World. 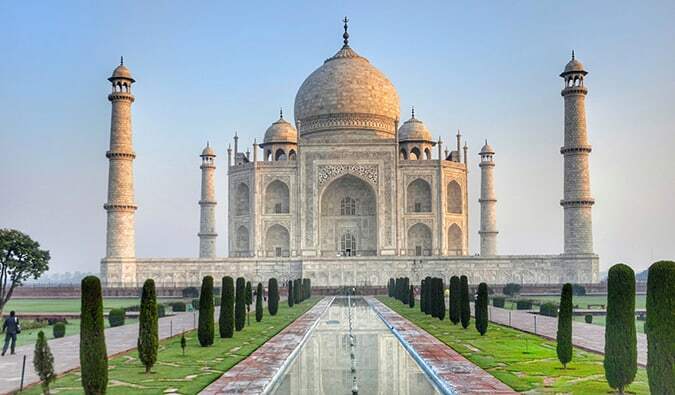 The Taj sees between two and four million tourists annually, so there have been recent restrictions on tourism in an effort to help protect the site. However, the greatest threat is the air pollution that is destroying the marble. The site is open from 8am-5pm from Saturday-Thursday and closed Fridays. Adults cost 1,000 RS. Children are free. The Alhambra is Granada’s — and Europe’s — love letter to Moorish culture, a place where fountains trickle, leaves rustle, and ancient spirits seem to mysteriously linger. Part palace, part fort, part World Heritage site, part lesson in medieval architecture, the Alhambra has long enchanted a never-ending line of expectant visitors. 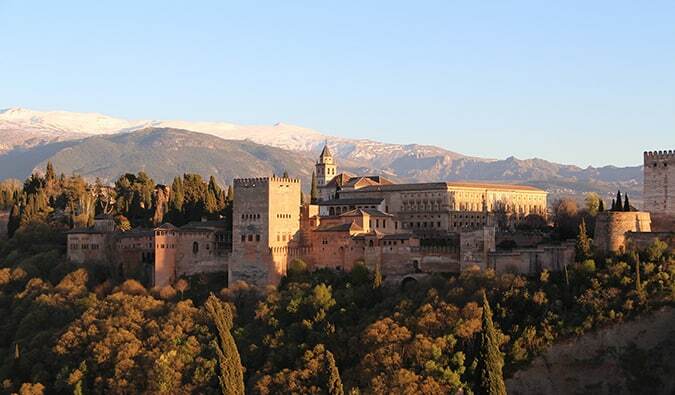 During the Napoleonic occupation, the Alhambra was used as a barracks and nearly blown up. What you see today has been heavily but respectfully restored. This is a beautiful site with so many various gardens and buildings, and its view of the historic area of Granada is second to none. Using public transport take line C3 and get off Generalife. The site is easily walkable from the downtown area of the city too. It is open daily from 8:30am – 8pm (April 1-October 14), and 8:30am-6pm (October 15-March 31). Due to high demand and visitor restrictions, I highly recommend booking in advance. Adult tickets are 14 EUR. Children under 12 are free. For more travel tips on Granada, check out this detailed planning guide. The Great Wall of China actually consists of numerous walls and fortifications. It was originally conceived by Emperor Qin Shi Huang (ca. 259–210 BC) in the third century BC as a means of keeping out the Mongol hordes invading the country. The best-known and best-preserved section of the Great Wall was built in the 14th through 17th centuries, during the Ming dynasty (1368–1644). Though the Great Wall never effectively prevented invaders from entering China, it’s still a massive engineering and construction feat and human accomplishment. 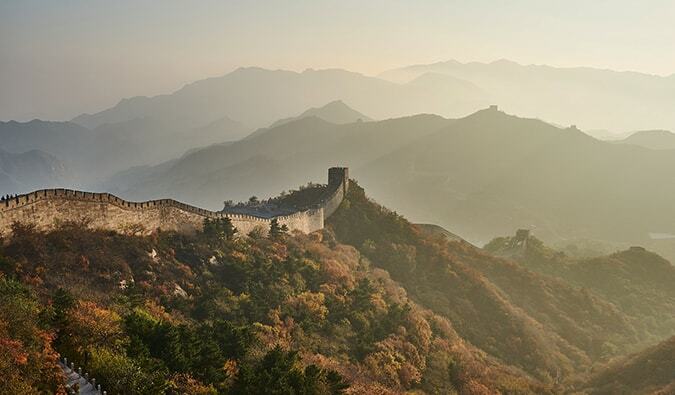 From Beijing, you can access the wall at Badaling, Juyongguan, Mutianyu, or Jinshanling. Badaling is just 47 miles from Beijing. You can easily take the public bus there for just 12 CNY. It takes less than 2 hours each way. Ticket prices for the wall are be.tween 30-60 RMB. Visiting hours vary depending on which part of the wall you visit. For more travel tips on China, check out this detailed planning guide. 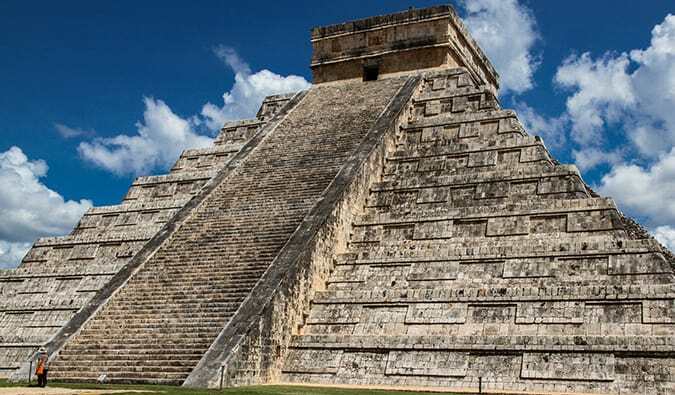 Chichén Itzá, meaning “at the mouth of the well of Itzá,” is the second most visited archeological site in Mexico and one of the New Seven Wonders of the World. It’s one of the most important Mayan historical structures in the Americas and has been restored greatly in the last few years. Chichen Itza is located 125 miles from Cancun and 75 miles from Merida. It can be visited as a day trip from either location. The admission fee is 188 MXN per person and free for children 12 and under. The site is open daily from 8am-5pm. For more travel tips on Mexico, check out this detailed planning guide. A major trading center and the southernmost settlement during Roman times, Volubilis in Morocco is one of the best preserved (and least frequented) ruins of its kind in the world. I found it empty of tourists, not built up, and open in a way that really lets you get up close and see the structures without being behind ten feet of barriers and jostled by crowds. Most of the city is still unexcavated, so the site has a very raw feel to it. I’ve been to a lot of Roman ruins in my travels, but I love this one the best. It’s a lovely day trip away from the crowds and noise of Fez. Entrance is 20 MAD (Moroccan dirhams), or about 5 USD. 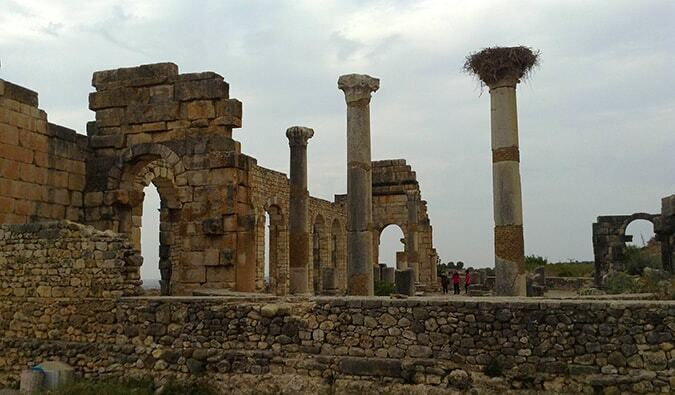 Volubilis is located about 19 miles north of the city of Meknes. It can be reached from Meknes by taxi, by car, or by organized tour. My preferred tour company is Intrepid. Volubilis is open daily and costs 20 MAD to enter. For more travel tips on Morocco, check out this detailed planning guide. 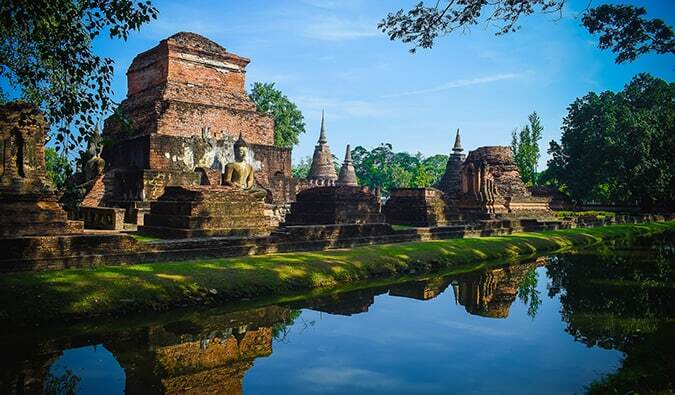 Located in a beautiful in north-central Thailand, Sukhothai was the capital of Thailand for a couple hundred years. This is site is often overlooked by travelers, as few stop there on the way to Chiang Mai. The central area contains 21 temples enclosed by a moat. Its many temples showcase the unique Sukhothai style of decoration, which incorporates Khmer (Cambodian) and Sri Lankan influences. It’s a huge, huge site and takes a good day or two to see. Most of it is exposed to the sun, so bring sunscreen or you’ll get massively sunburned. Buses from Bangkok’s northern bus terminal run daily between 7am-11pm. Prices start at 500 Baht. The journey takes about 7 hours. Buses run between Chiang Mai and Sukhothai from 7 am to midnight and fares start at 400 baht. The park is divided into five zones. Admission to each zone is 100 Baht or you can purchase a pass to all five zones for 350 baht. For more travel tips on Thailand, check out this detailed planning guide. 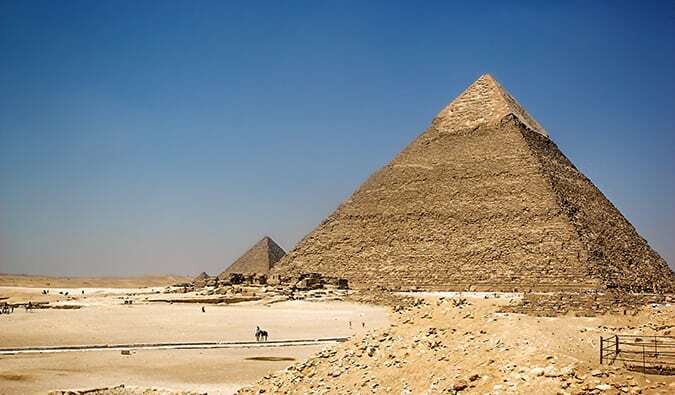 ***The world has many amazing historical sites and these ones are the best but, even if you don’t make it to these, there are plenty more out there worth seeing. Just look some up where you are going! Make your own list! The more you know and understand the past, the more you can understand why people act the way they do in the present. Visiting these attractions and learning our history helps us get there! Looking for more places to travel? 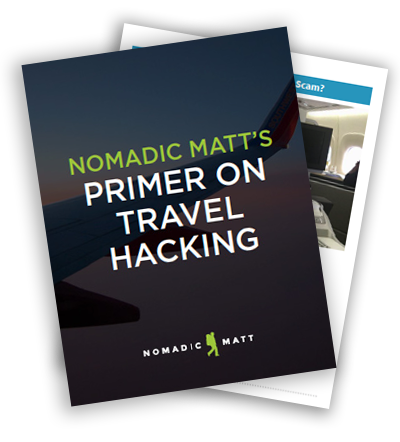 Check out my in-depth planning guides to over 60 countries and go somewhere great today! You can book a hostel with Hostelworld as they have the largest and complete inventory. 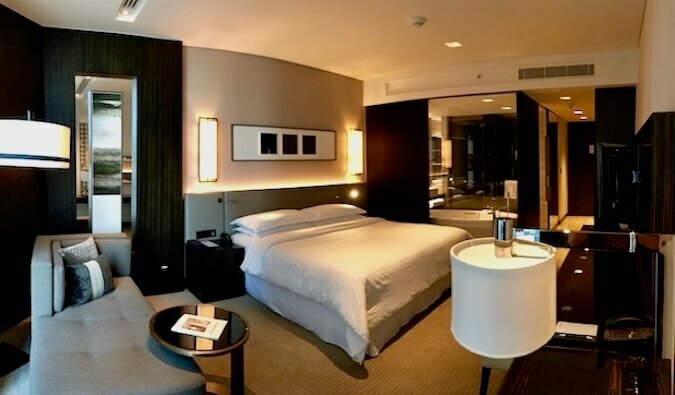 If you want to stay at another type of place, use Booking.com as they consistently return the cheapest rates for guesthouses, B&Bs, and cheap hotels. They are the best! Don’t forget travel insurance – and protect your trip! The 1st two – awesome. I think the next one I visit might be Easter Island. But I heard the hotels on the island are pretty pricey. Pyramids would be awesome as well. Tikal is incredible. The best place I’ve ever been, definitely. I’d recommend it to anyone. I actually found Stonehenge a disappointment though. Hey Matt, change of plans…I’ll be in Paris in July! Let me know when you’re stopping by and we can maybe meet up for a glass of wine or something. @geoff: Tikal was one of the best places I’ve been. I liked it better than Angkor wat. …it was more like a historical ruin than a tourist attraction. I liked how you late at night or in the morning and was just you and ruins. Peaceful. @ erika: Welcome!!! I’m glad to have new readers! @quick: i’ve been to 5. Which 6 did you go too? maybe we can make the whole ten together!! i live my life by lists and love all the ones you share on your blog! you’ve picked some great rec.s for this list! i definitely want to see Macchu Picchu! I had a friend do the Macchu Picchu trek, she said it was amazing, they originally had trained for Kilimanjaro but her mom got sick beforehand. I’m jealous of your travels. I’m new to your blog so I’ll have to check it all out! Angkor Wat in on my list nearest to my place. I think 10 is a very short list considering the modern world is bigger than the ancient one. This is a great list of interesting sites to consider. Petra would be pretty amazing! Your first was my first and it was amazing. I think my next one would be Easter Island… I am a sucker for Archaeological points of interest!! I am headed into Equador… I dont think there is much there. Adios mi amigo! I’ve only been to one of these and was slightly dissapointed with the Colesseum. It looks so tiny compared to when you see it on tv/pictures. The city of Pompei was interesting though. I’d kill (not really) to see Petra and Macchu Pichu, especially after Indy 3 and Diarios de Motocicleta. @Anthony: When I first saw the Colosseum, I felt the same way but as a circled around it and it just got bigger, the more I liked it. @Domina: I’m jealous!!! I bet the trek there was AMAZING! I’ve been to 4: Petra, Pathenon, Colosseum and Taj Mahal (this, twice). Feel like checking out the rest sooner than later. Nice post that made me feel there’s so much more to see. Oh btw, one of the top historical places that I’d recommend is the Khajuraho Group of Temples. The temples are simply awesome. Am gonna write a post on them shortly. Thank you for your visit to my blog and leaving your kind comments. 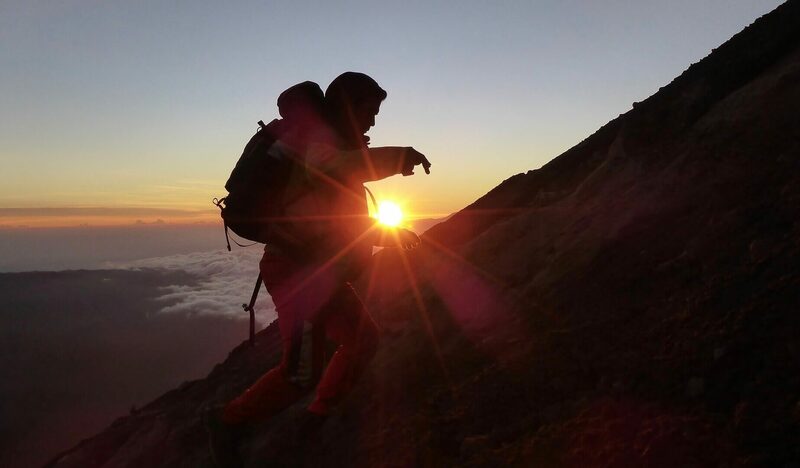 A trip with him was like a trip with a friend not with a formal guide. From my experience, http://libertytourism.com/Programs.html is one of the best tours at Jordan where all you may need and ask on one place. Fantastic list. I have seen six of these places and would love to visit the other four. Two others that I am keen to see that would be close to making the list (though difficult to know which ones I’d remove) are The Great Wakl and the Terracotta Warriors both in China. I agree with these but probably would leave out Stonehenge and replace with one of the amazing places in the Middle East such as Persepolis in Iran, or Jerash in Syria or Baalbek in Lebanon. How about the amazing ancient ruins of Mexico …my fave being Palenque in the south. Ive been to all on your list except Stonehenge, Parthenon, and Easter Island. Hi Matt, thanks for the great pages! Just a couple of points on Stonehenge that readers may like to know. It is possible to get inside the Stone Circle, but you need to arrange it with English Heritage (the body that looks after the site). You can do that by simply typing ‘Stonehenge special access’ into Google and you will get to the current PDF form to apply. Note however that access times are limited, both by time of year – and only early morning or evening (after ‘normal’ opening hours). Another way is to book with a specialist tour operator who can do the whole thing for you, again they can be found on the web. The second point is that the large iconic stones of Stonehenge came from not too far away; these are hard sandstones – locally known as ‘sarsens’. It was the much smaller igneous rocks (that you hardly notice until you get inside the circle), that came from Wales. Readers may like to look out for a recent book called ‘Solving Stonehenge’ for more and new information on the site. If you are making a journey from somewhere half way across the world I think it’s well worth both arranging to get inside the Circle, and reading up on the stones. These are amazing, sadly i haven’t been to any of these but then again i’m only 18!! I doubt all of these will get visited by me. I live in England so could easily go to stonehenge. 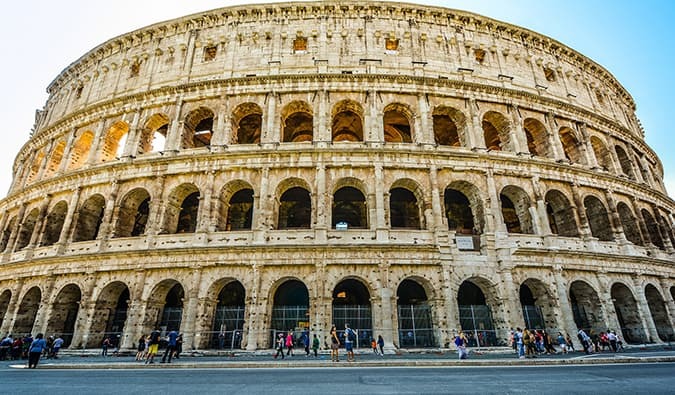 I have personally always wanted to go to the Collosseum, as i am astonished by History, and have an attraction to Italy, (Venice,Florence etc). Machu Piccu and the Pyramids/Sphinx WILL be visited by me, i will make sure!! what about Palmyra in Syria? I think it shoud be in the list. I’ve been to 2 of these, but if you are going to visit stonehenge you should make a quick trip to nearby Avebury stone circles in Wiltshire. A huge henge with a real feeling to it. would you please add some other places to your list!? for example persepolis in Iran which is a magnificent ancient place, dates back to 518 BC. can be added to this list!Also some other places in China! I really want to go to any of those places… Hope…. like to see them by myself. I’d agree with the majority of this list, except for Stonehenge. I’m studying in engineering college in MP. I really want to go to any of those historical places, specially “The Taj Mahal”. Hope my dream comes true. Shatt Gomvuge mosque and Sompur Bihar Temple in Bangladesh also be the heritage site of the world. Petra would be pretty amazing! I’ve only been to one of these and was slightly dissapointed with the Colesseum.The city of Pompei was interesting though. I visited Stonehenge in 2010, and was able to go inside the stones and touch them. It is not true that you cannot go inside. You just have to pay like 16 euro or something to the English Heritage people and you get an hour in there with only a few other people. I think it deserves to be on the list. I felt wonder and power there. what about Persepolis – Iran ? Hey Matt! Great list. Have hiked the Inca Trail to Machu Picchu, done the Pyramids at Giza, Petra (both the Treasury and the Monastery), Stonehenge, the Colosseum & Forum, the Parthenon / Acropolis, the Alhambra, the Great Wall (Mutianyu), Chitzen Itza a couple of times back when you could hike to the top. All awesome places. Your others are on my list, too. I’ve visited 47 countries so far and feel like such an amateur when I run into people that have traveled so much more than me. The Cliffs of Moher, Giant’s Causeway, the Burren, Knowth and Newgrange in Ireland, Ephesus in Turkey, safari in the Masai Mara in Kenya, Man of Storr in Scotland would sure be great adds IMO. Thanks! This is a fantastic list! I have been to 8 of them. I can’t wait to see the other 7! Nine of the sites from your list are my choices as well. Unfortunately, I’ve been to only two (Egyptian pyramids/Sphinx and the Parthenon), but I made fake photographs of another 6 by photo-montage. There is a great application where you can blend two photos into one. I made mine with Machu Picchu, Easter Island, Taj Mahal, The Great Wall of China, Colosseum and Stonehenge. I even made a picture where I’m standing on the Moon’s surface. I would love to travel much more, but unfortunately neither my financial nor medical situation permit it. I love that you wrote this article from the angle of you should see vs. don’t see. I get so frustrated with the articles that say silly stuff like “don’t go because it’s over crowded.” For me this is a given for some of these gems and seeing them is something all should experience. I’ve been to four on the list, doing Cambodia in Nov and Peru in 2020. Great list! I would be curious to read your USA top must see if you have one? Great post Matt! There’s quite a few on that list I’ve been to already. A couple of modern mentions would be good too. One of my favourites is the lesser known Cornish and West Devon Mining Landscape – a World Heritage Site too. It’s such a beautiful place. But also pivotal to the modern mining industry.